If you have a Team or Business subscription, you now have more options than ever for your default text styles. You can add as many default text styles as you want. You can also adjust the font color, line spacing, all caps, and more. To add or edit your default text styles, click the "Brand Assets" tab, then go to "Default Text Styles". Note: only admins can make changes to the styles. On the left panel, you can now add a rhombus shape to your document. You can also adjust the angle of the two ends. If you have multiple text boxes that have the same formatting, you can now quickly copy a style and paste it to a new text box. Step 1: Format the style of your text box. Once you have it like you want, click the paintbrush tool on the top menu. You can also double-click on the paintbrush to keep it selected. Step 2: Click on another text box. Notice how it will transfer the same formatting and style from the first text box. With Data Automation, you can connect data from a Google Sheet, an MLS, or an XML feed to Lucidpress. For example, if you have an employee directory built on a Google Sheet, you can merge the data into Lucidpress. Each column header (person's name, email, department, etc.) can then be added as a smart field to your documents. You can then swap between employees and have their information automatically pull from the Google Sheet in seconds! If you have a Business subscription, you can now disable InDesign imports for your general users. 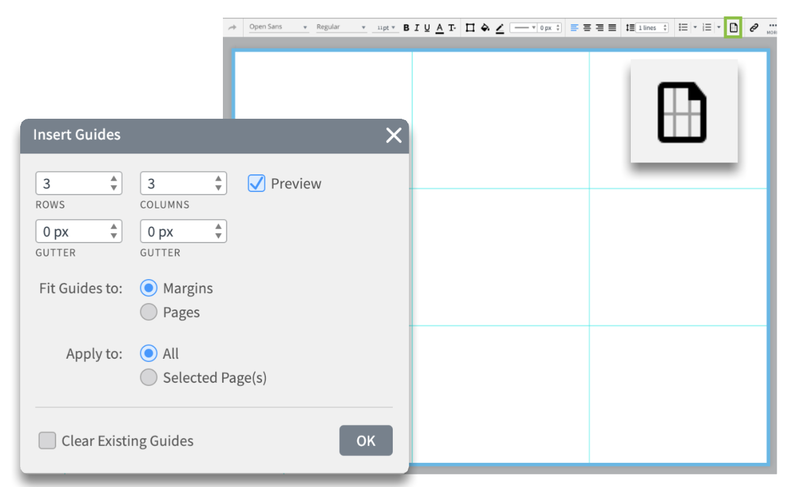 The option to import from InDesign will remain available for your admins. To find this setting, click the "Brand Assets" tab and go to "Settings". Creating copies of your documents is now easier than ever. Simply select the document(s) and right click to copy. 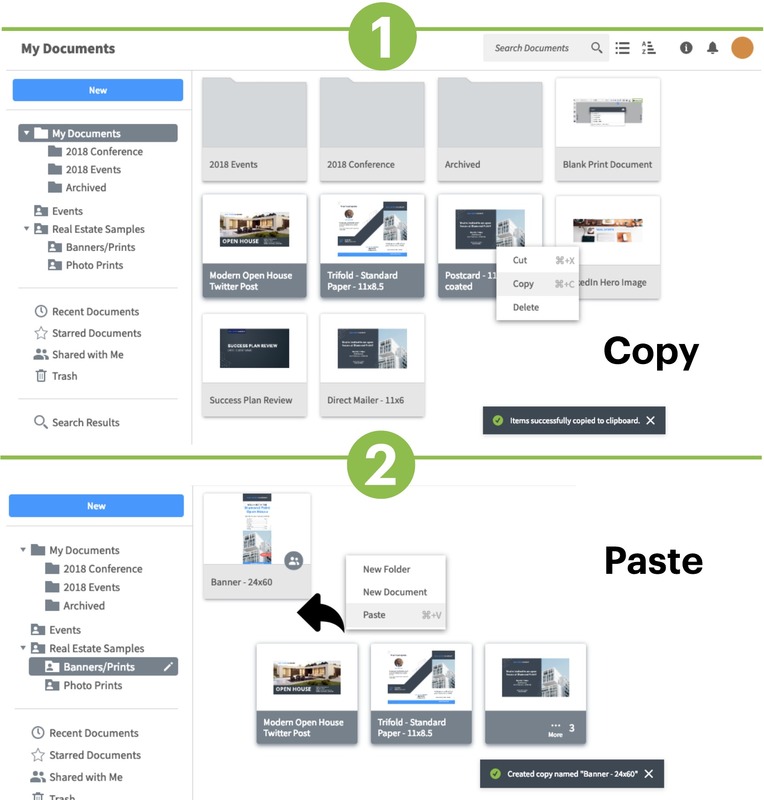 Copied items will be stored in your clipboard until you right click to paste them in a new location. Enjoy Lucidpress even more by being able to find exactly where everything is. Simply click the feature find button in the top right corner of Lucidpress and a search box will appear. As you type, results will automatically be generated and a blue arrow will show you where to find the feature you are looking for. Feature find will also provide an option to search in the help center for more in-depth directions. Create mutliple guides for multiple pages. 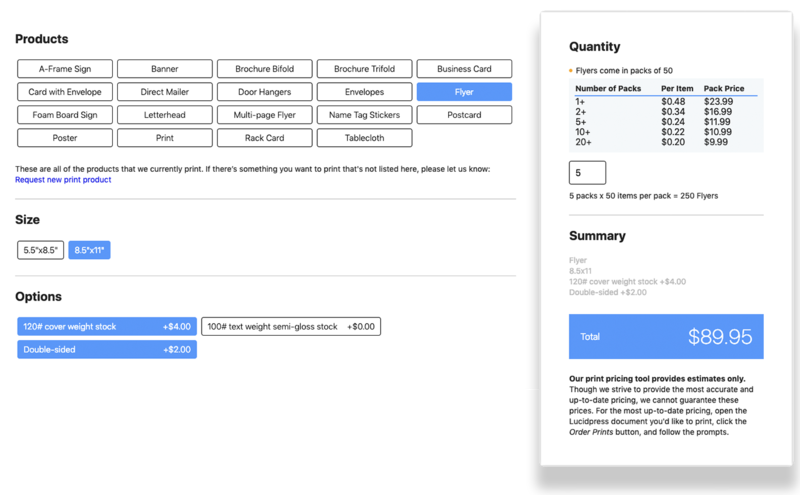 With a new print flow, you can now visualize what your print will look like and make small changes before you order. Lucidpress has outgrown the Classic interface and is taking a brilliant leap forward with a new Platform design. Access to the Platform Beta will be enabled on December 10th, and we encourage you to take a look around! If you like what you see, feel free to extend access to the users on your team; they will be able to switch back and forth between Classic and Beta for at least 3 months while we collect feedback and polish the Beta. View what your post will look like before your document even touches social media. Sharing your documents to social media now has a completely different feel. Instead of posting just the links to your documents, Lucidpress posts both your selected image, and a specified image without you even having to touch the platform. In Facebook, you can also post directly to pages or groups. Everything is now easier to navigate- including: darker tabs and cleaner looks! There is now more room to move around! Similar to Photoshop or Indesign, you can pan around the editor so that you can move around your document easier when editing. You can now send direct mail to specific locations and demographics. USADATA automatically filters the information you need to indicate the specifics of your target audience in the the area that you select. The Lucidpress Customer Success team designed new courses to assist with the onboarding process where you and your users can discover all of the features Lucidpress has to offer. Better yet, these courses are tailored for your specific user role. If you are an admin looking to create templates, we have you covered. If you are a user within a Business account and want to know how to work with the locking restrictions placed on your documents, you can learn it all here. Along with the many other field options available with Lucidpress data automation, you can import your MLS data for room dimensions. "Notes" is a new collaboration feature that you can use with your templates. Say you want to include instructions on your template when your users go to generate a document. Any notes you place on specific objects or text will remain. This can be super helpful to give users specific instructions without having to email them! You can now disable the new document button and prevent your users from going off brand and creating their own material. Using this feature will restrict your users to only create documents from your existing templates. As an admin, you can control whether or not your team can use colors that are off brand. Make sure to set your brand colors in the Admin > Brand Management section before turning on this setting. This ensures that your team has access to all your brand colors (be sure to include black and white as well). No longer will your contacts need to open your published document in Lucidpress to click on your links. They can click on the links right within the email itself! Does your organization use Constant Contact? Now you can create your email and campaign within Lucidpress. After creating your campaign, your HTML code will seamlessly be uploaded to Constant Contact. Print and Ship has been improved and expanded! Three more products are now available to order: 24x26 inch A-Frame Posters with stands, 11x17 inch Posters, and 120# cover weight stock flyers. Team and Business accounts can now set a default bleed and default color profiles to ensure that all of their users create great, print-ready content without having to even think about. page bleeds or color profiles. With the new direct mail feature, it is now possible to send mail in bulk to multiple addresses directly from Lucidpress. Simply create a new Lucidpress document, upload a CSV of addresses, and order prints. The prints will be mailed out to all the addresses in the CSV. Two new fields have been added to the Smart Field options: Agent Number and Home Office. An "Account" button has been added to the header of the documents page through which you can directly access your account settings. The UI of the brand management panel has been updated. Click on the tabs to the left to navigate its different sections. See the Brand Management article for more information. A documents publication manager has been added to the documents page where you can see and manage your published documents. To open, click "Document Publications" in the folder manager. Click the paper clip to copy the URL of your published document, the pen to open the document in the editor, and the trash icon to permanently delete the published document. You can now populate smart fields with images. To do so, go to Insert > Smart Fields > Account > Logo/Profile Image.